Explore the sights above Lost Maples at night! Attend a star party or marvel at the stars on your own. 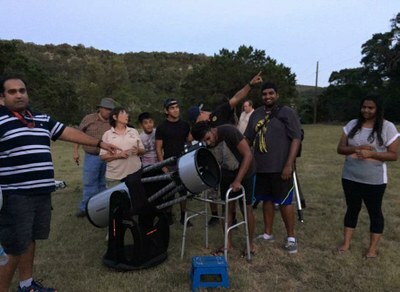 Check our Events page for star parties and other events. Lost Maples State Natural Area Light Pollution Map. The park is at the crosshairs. Visit the Clear Dark Sky website for more information. A Clear Sky Chart is an astronomer’s forecast about sky conditions, including, darkness, cloudiness, transparency and the seeing quality. Find more information about the Clear Sky Chart. Below you will see the real time sky darkness measurements at Lost Maples State Park. Remember, the meter does not take readings during the day. To learn more, look up current moon phase information for Lost Maples State Natural Area or see the current moon phase calendar.